If you jump towards the present-day era, sugar skulls have always been considered as an integral part of the Day of the Dead celebration in Mexico. Much like the usage of actual skulls to represent both birth and death in ancient customs in this month-long celebration, sugar skulls also signify the same two things and have become an important symbol of these ceremonies. 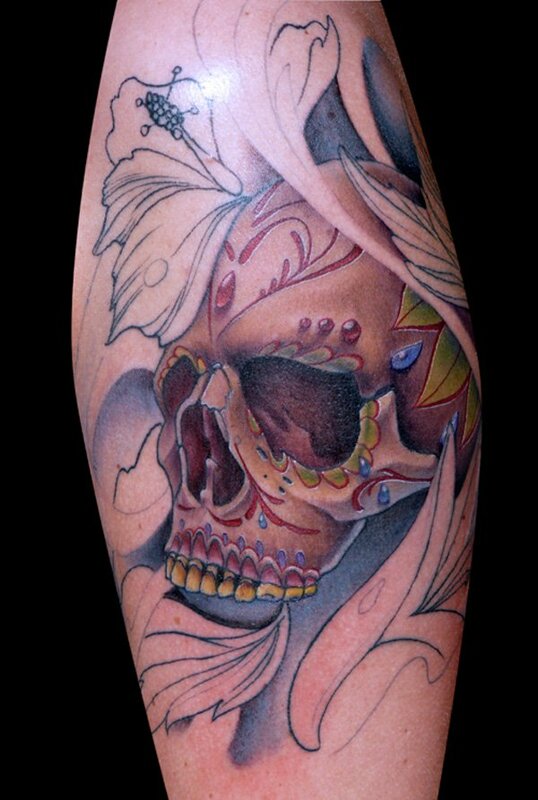 This is where the sugar skull tattoo come into the picture. Since the dawn of the modern age, the sugar skull tattoo has been a staple of the Day of the Dead. Either by face paint, henna tattoo or in a permanent tattoo, a Day of the Dea celebration is not complete without the sugar skull. 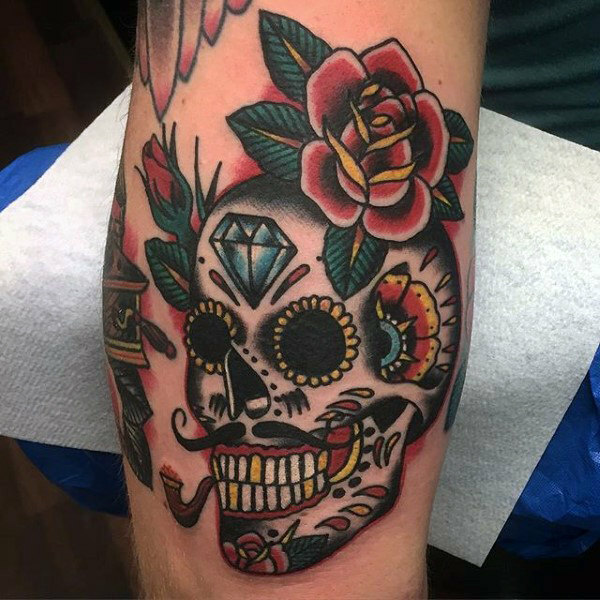 In this article, we will be talking about the sugar skull and the various designs you can do with a sugar skull tattoo and the preference of both men and women on this tattoo design. 1 What Is A Sugar Skull? What Is A Sugar Skull? A sugar skull is a representation of a human skull. The term is most often applied to edible or decorative skulls made (usually by hand) from either sugar (called Alfeñiques) or clay which are used in the Mexican celebration of the Day of the Dead (Día de los Muertos) and the Roman Catholic holiday All Souls’ Day. Calavera can also refer to any artistic representations of skulls, such as the lithographs of José Guadalupe Posada. The most widely known sugar skulls are created with cane sugar and are decorated with items such as colored foil, icing, beads, and feathers. A highly intricate and detailed sugar skull tattoo with galaxy tattoo details. A bbluish-green sugar skull tattoo with two roses. 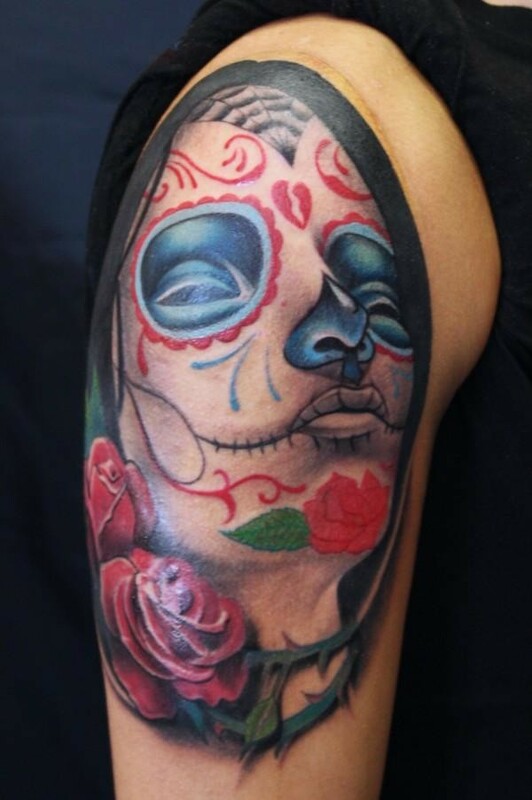 In order to honor the dead or commemorate the passing of a loved one, the sugar skull tattoo must be large in size to show off all the unique colors and designs. 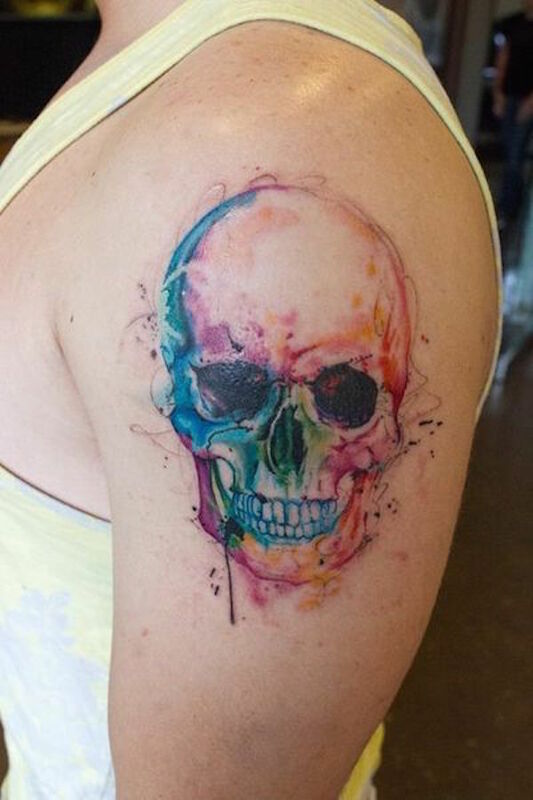 To honor their passing, the name must be on the head of the skull, while the rest of the skull is completely colored in with vibrant ink colors. There can be no other writing except for the forehead of the skull. This tattoo design is symbolic of death, celebration, remembrance, spirituality, and eventual return. The sugar skull does not represent a fear of death, more of a celebration or moving to the next life. 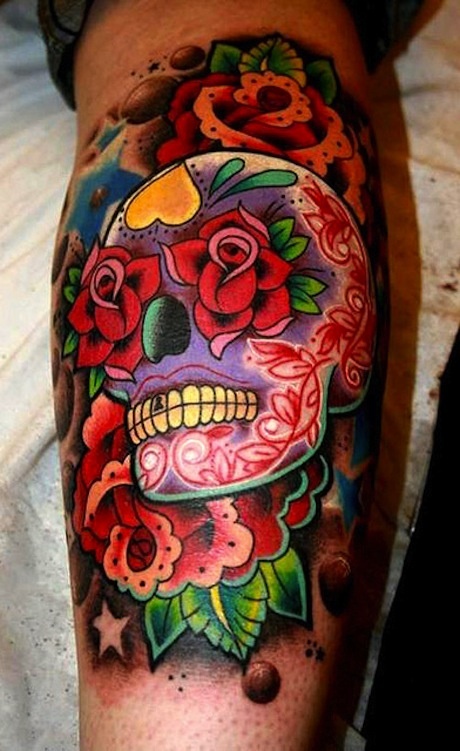 The sugar skull tattoo is known to be very vibrant and lush with color and detail. The intricacy of the design is what makes this tattoo so unique from the other tattoo designs established in North America. 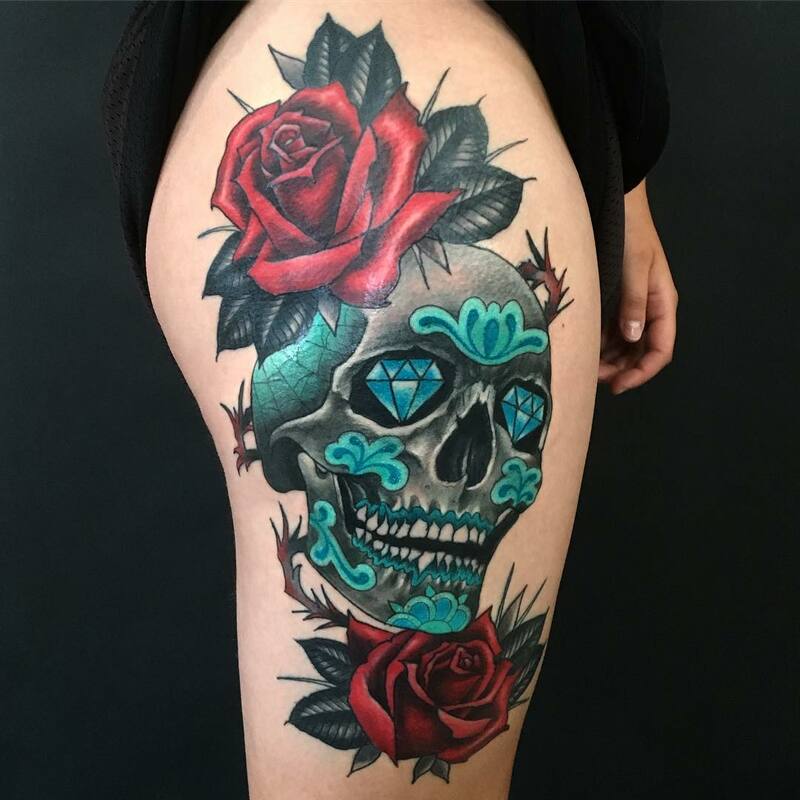 A large thigh tattoo of a sugar skull with two roses for eyes. A highly detailed black ink only sugar skull tattoo on the leg with two additional roses. three different sugar skull tattoo designs. A highly detailed and vibrant sugar skull tattoo inked on the upper sleeve portion of the arm. If you take notice of tattoo designs that people often get, you find something interesting; almost all of the designs they have are two dimensional or flat. This “flatness” of the designs you always see kind of makes the design usual despite the complexity of whatever tattoo design you saw. This is where 3D tattoo designs have an edge because it is not flat, it can be easily seen among the sea of tattoos around you. To add to that, a 3D tattoo is very meticulous to make because the tattoo artist would not only have to ink the main design but also the shadow as well (if it has any). Contrary to what tattoo artists often say, any design can be turned into a 3d tattoo if the tattoo artist you have has the guts and creativity to make one. Since the 3D tattoo is now slowly dominating the “traditional tattoo” design market, more and more tattoo artists are somehow forced to adapt their once flat traditional tattoo designs into 3D tattoo designs because of the demand. 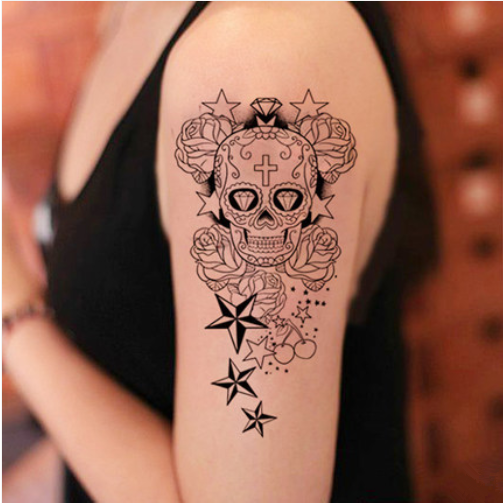 The sugar skull tattoo was always thought to be a “flat” or 2D tattoo design but some tattoo artists began using the sugar skull tattoo in their 3D tattoo portfolios and since then, it caught on. An intricately detailed three dimensional sugar skull tattoo on the sleeves. 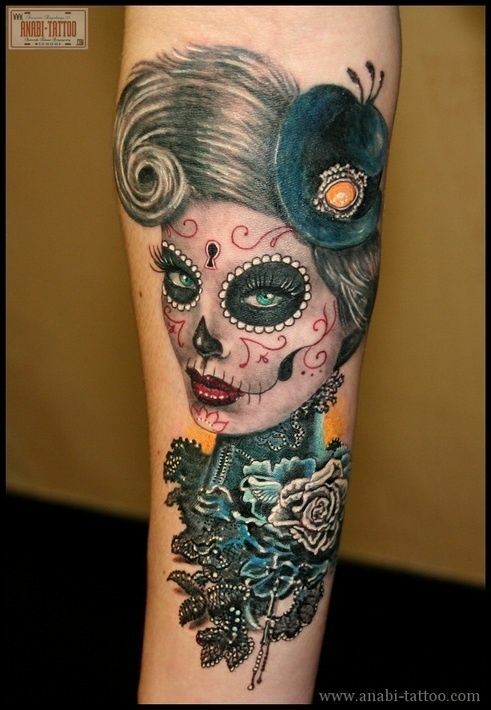 A highly detailed sleeve tattoo of a sugar skull of a woman. 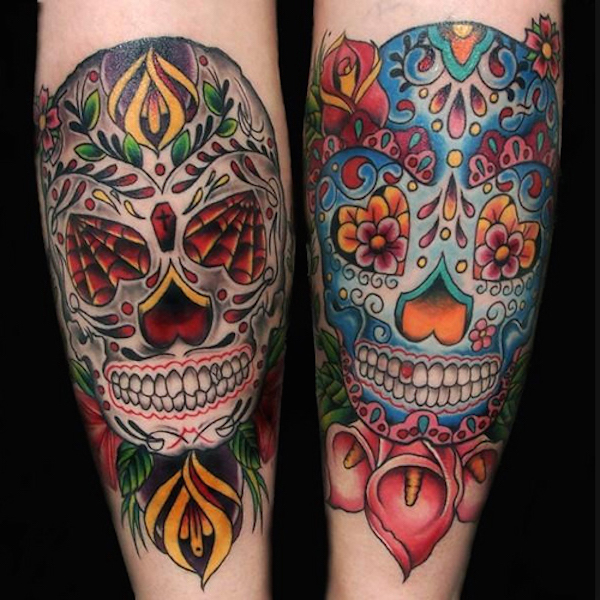 A large leg tattoo of a sugar skull with additional floral detailing. 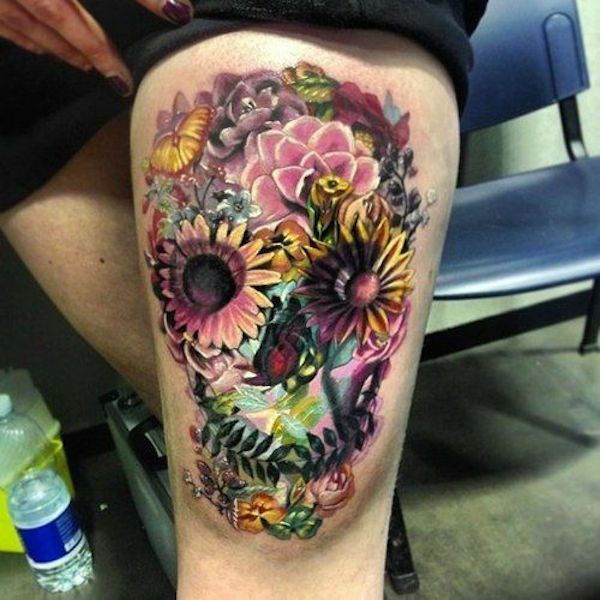 A leg tattoo of a 3d sugar skull with many floral decorations. 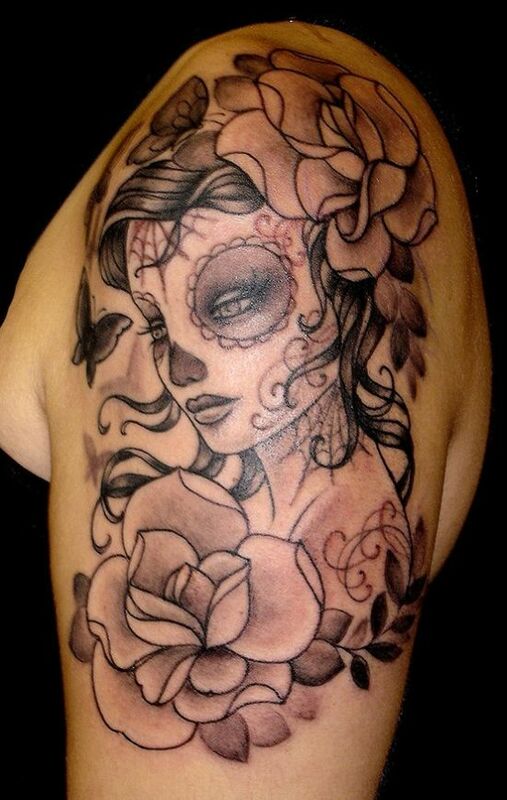 A tattoo of a 3d woman sugar skull with floral head dress. 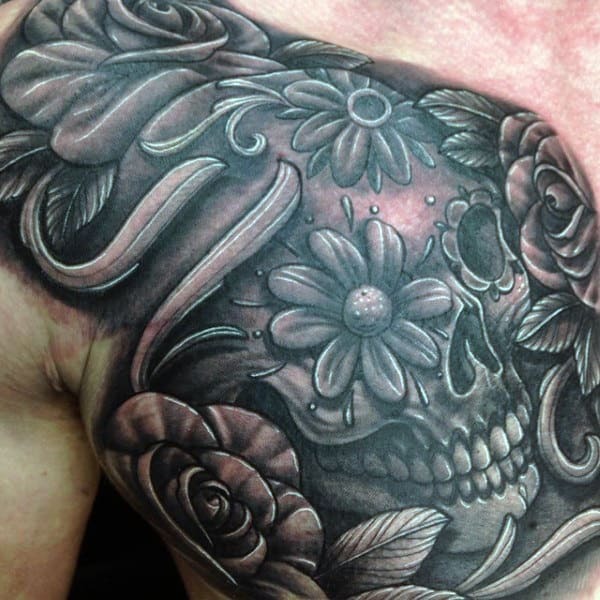 A black ink 3d sugar skull tattoo on the chest. 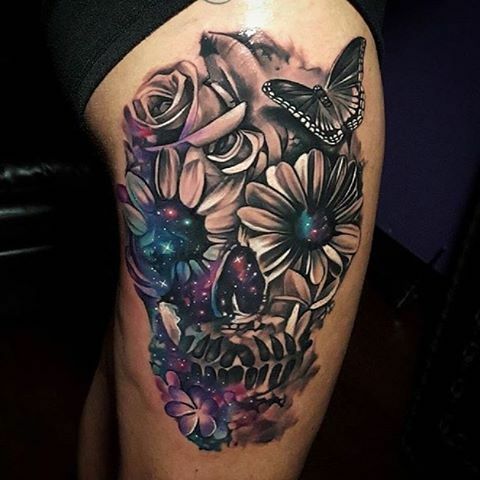 A large leg tattoo of a 3d sugar skull. 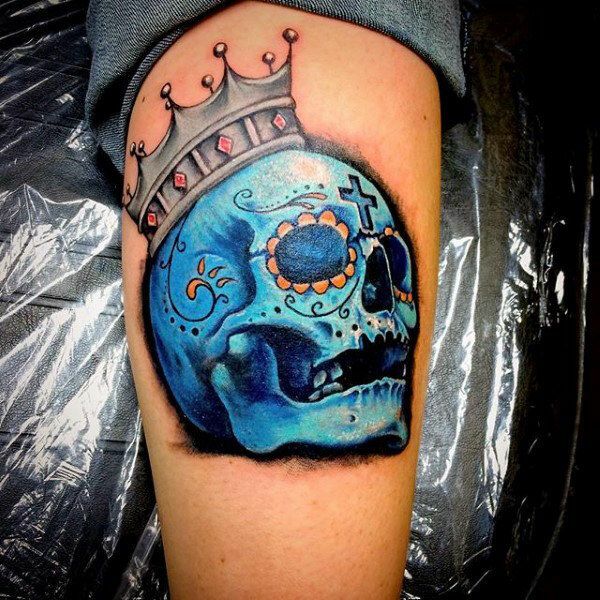 A leg tattoo of a three dimensional blue sugar skull with a crown. 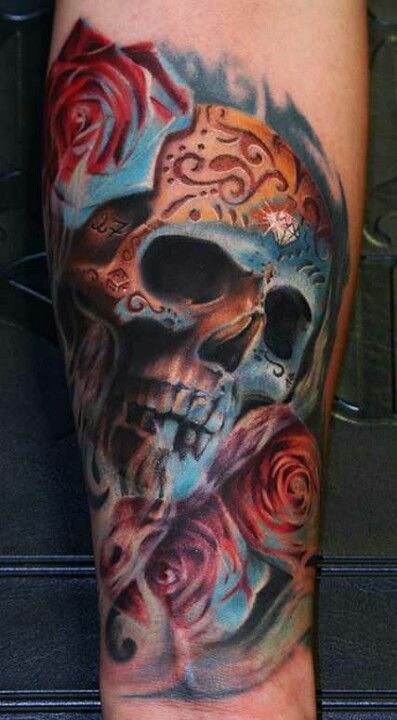 A three dimensional sugar skull tattoo with roses. 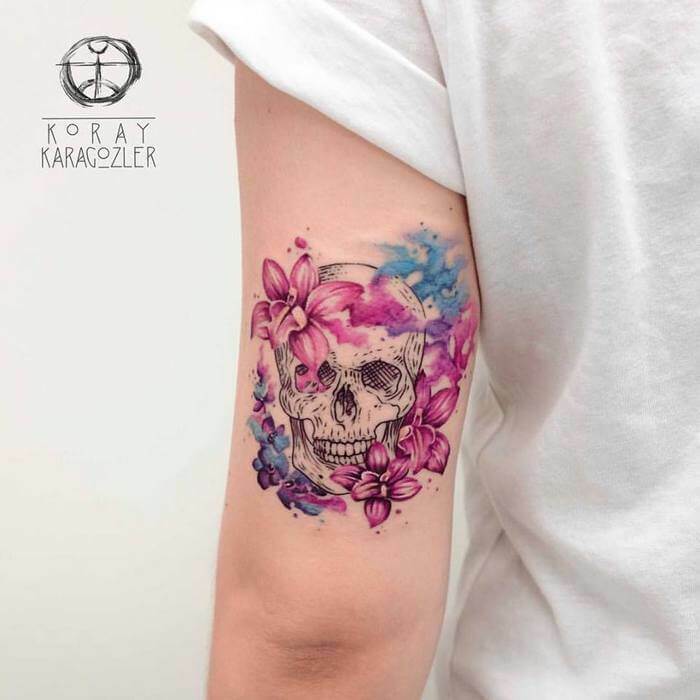 Over the last decade, the explosion of various tattoo ink colors resulted in an idea that is then considered bold and inconceivable by old tattoo artists and enthusiasts: Watercolor tattoos. Everyone thought that mimicking modern art on the skin will never be possible until the first batch of watercolor tattoos sprung up in the latter half of the 2000’s. These tattoos were considered out of this world because of its richness in color that was never before seen in the industry. Soon, the design caught on and it is now a trend for both tattoo artists and enthusiasts. 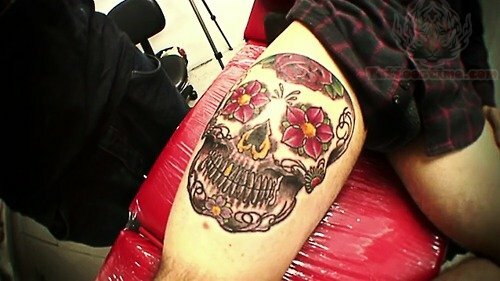 One of the designs that are most usually used for this tattoo style is the sugar skull tattoo. The tattoo design itself is just bursting with color and with the addition of the watercolor tattoo, it is just color tattoo overload! 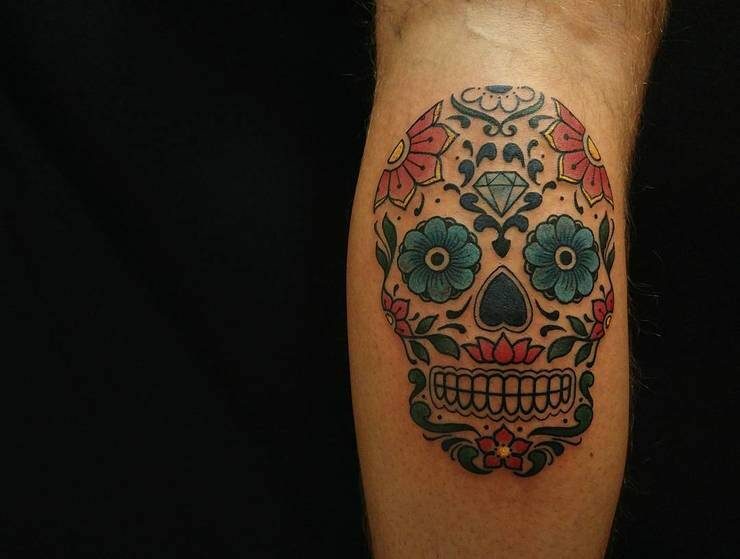 A small but intricately colored and detailed sugar skull tattoo with blue and pink flowers. An intricate watercolor sugar skull tattoo made of flowers. A simple sugar skull tattoo on the forearm that is spruced up by additional watercolor tattoo detailing. 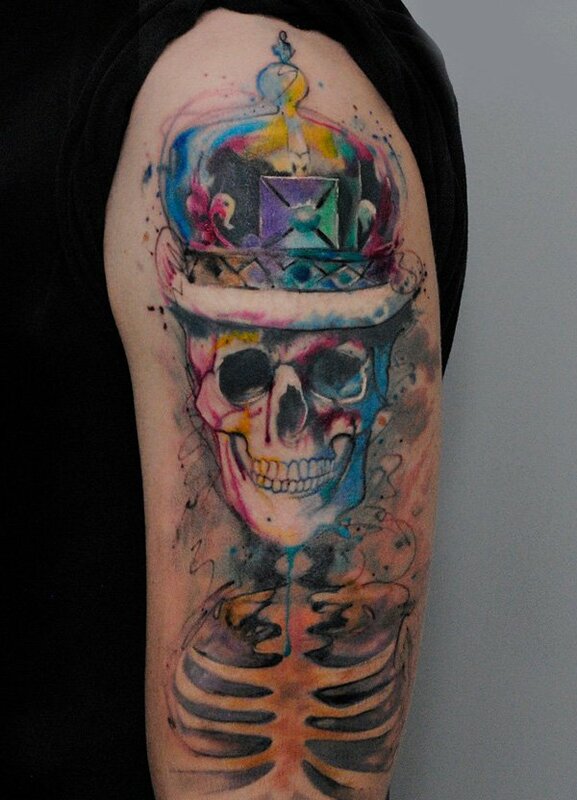 A shoulder watercolor tattoo of a sugar skull. A half sleeve tattoo of a sugar skull and its ribcage. 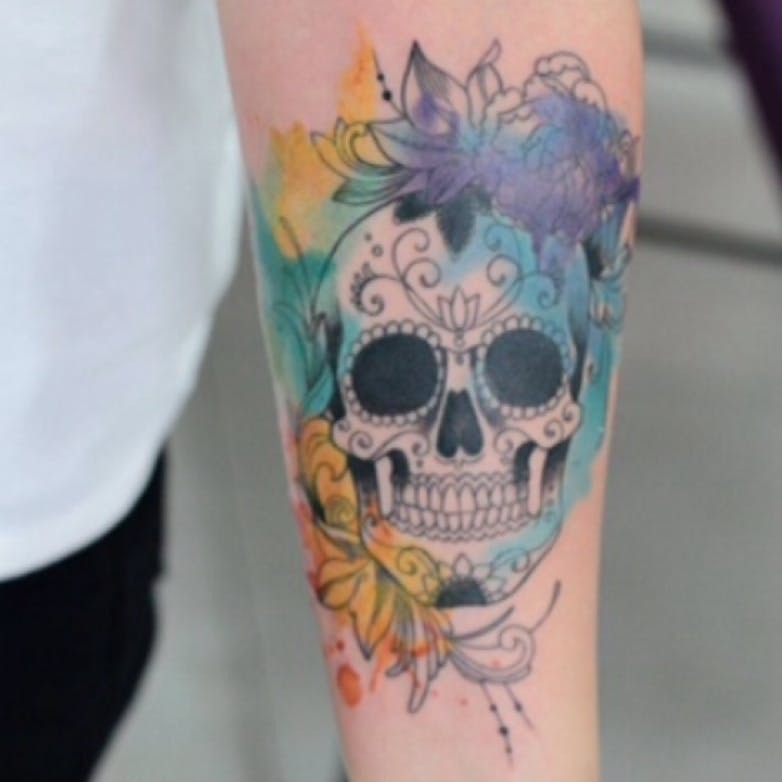 A black based watercolor tattoo of a sugar skull on the forearm. 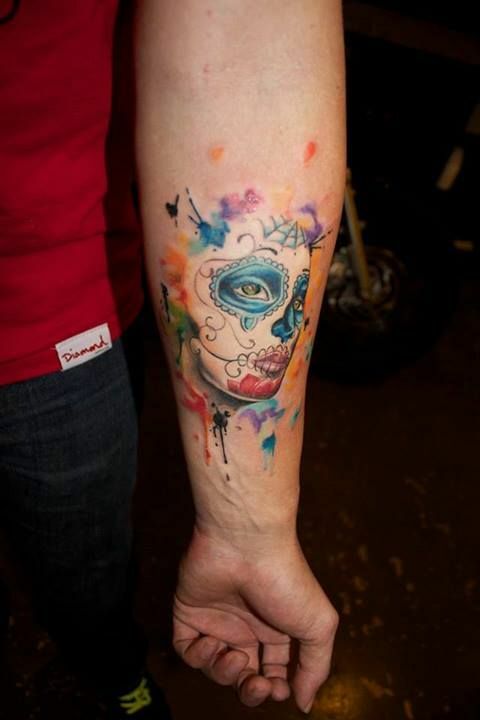 A forearm tattoo of a watercolor sugar skull. A vibrantly colored and intricately made watercolor sugar skull tattoo on the forearm. 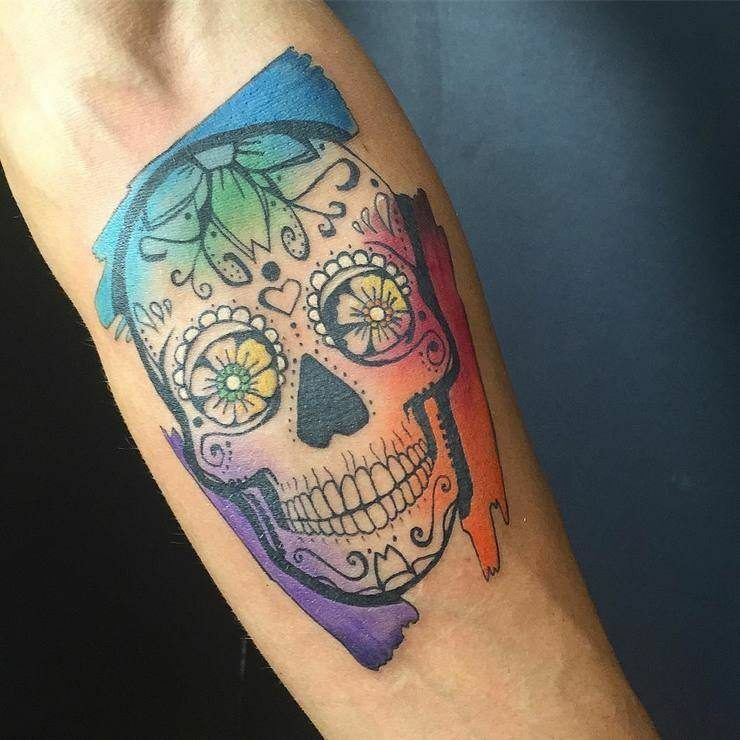 A rainbow colored watercolor sugar skull tatoo on the forearm. 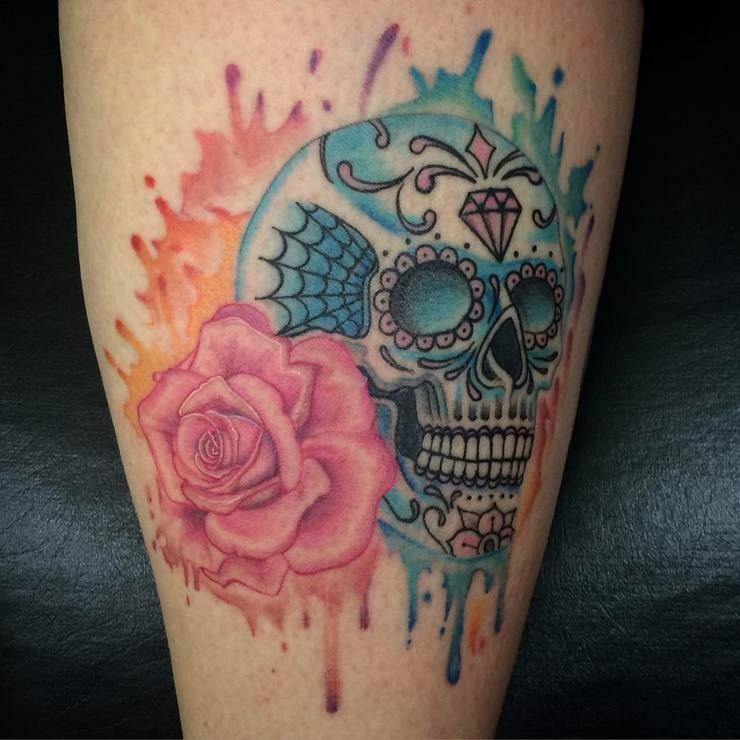 A watercolor tattoo of a blue sugar skull with a pink rose. 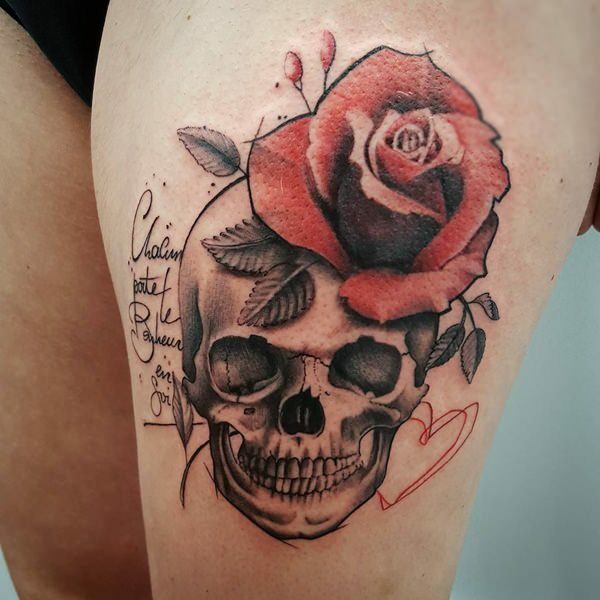 This is one of the few tattoo designs out there wherein men and women do not differ that much when it comes to choices of how they detail their sugar skull tattoo. 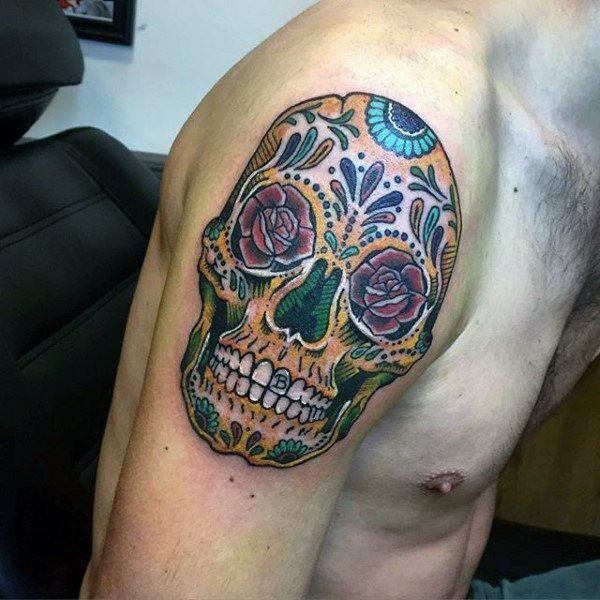 The one thing that we think presents as the only difference for men and women is that some men opt to have their sugar skull tattoos in black to make it look more traditional and “manly”. Other than that however, we think both genders would prefer the same thing. 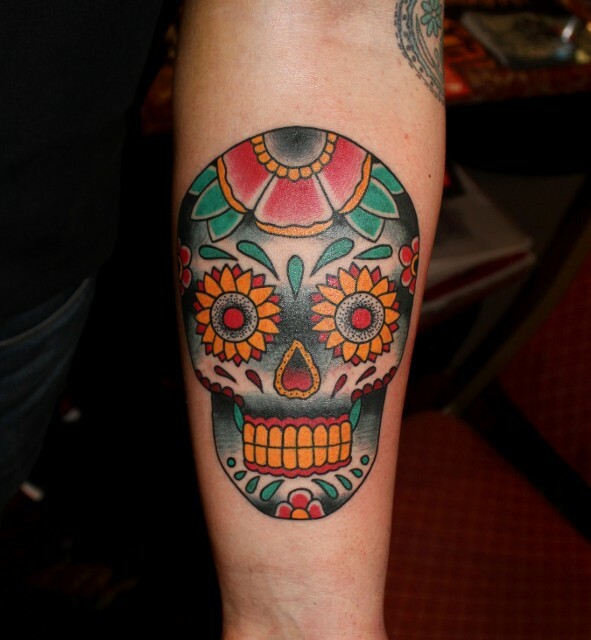 A highly detailed white red and yellow sugar skull tattoo on the forearm. A pair of sugar skull tattoo designs inked on the leg. 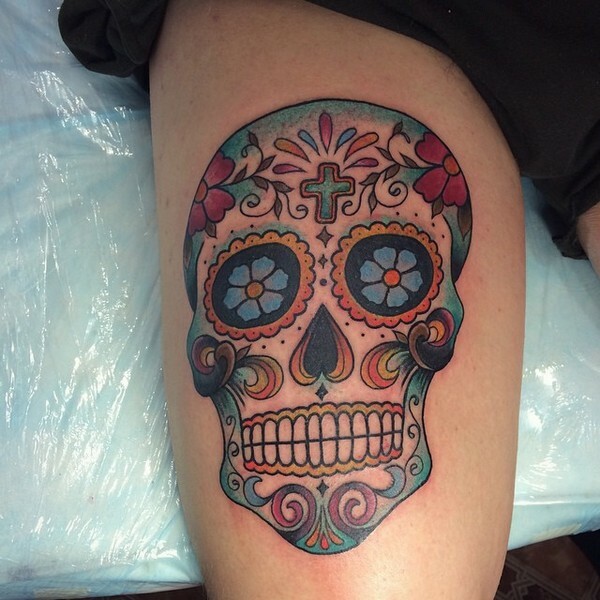 A large thigh tattoo of a sugar skull. 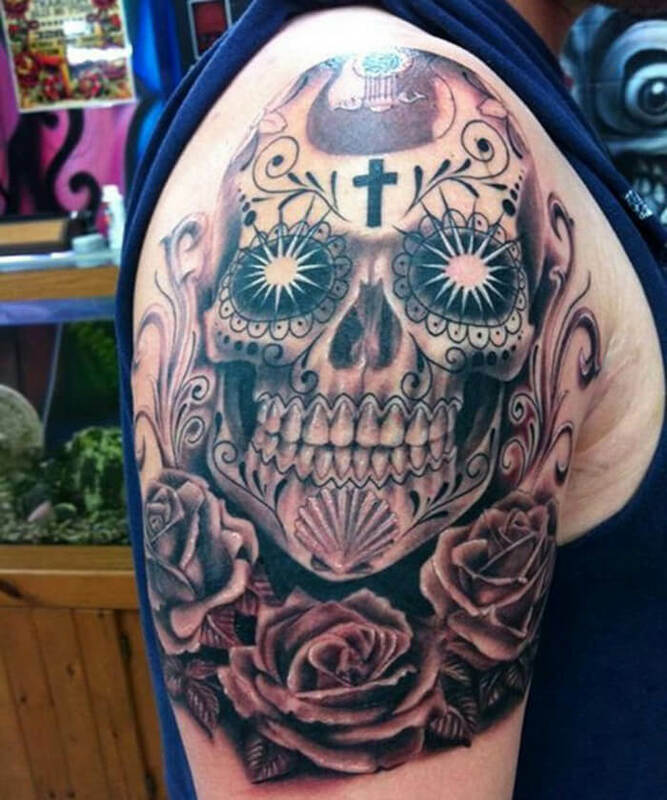 A highly detailed half sleeve tattoo of a sugar skull with a lot of additional decoration. 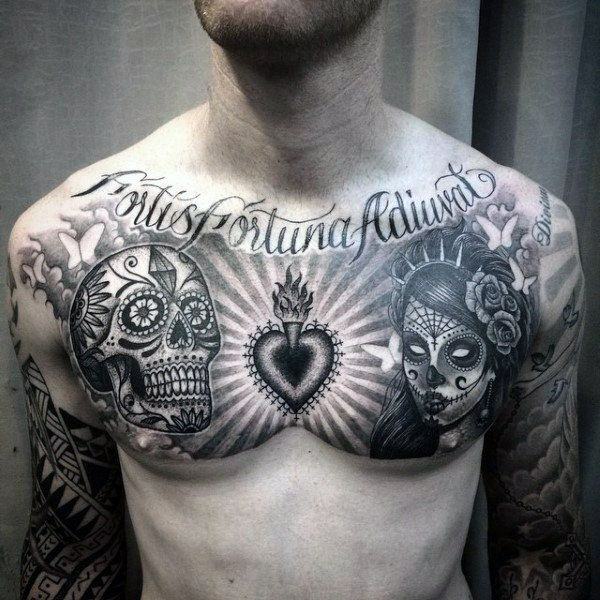 A large chest tattoo of a male and female sugar skulls and a heart in the middle. 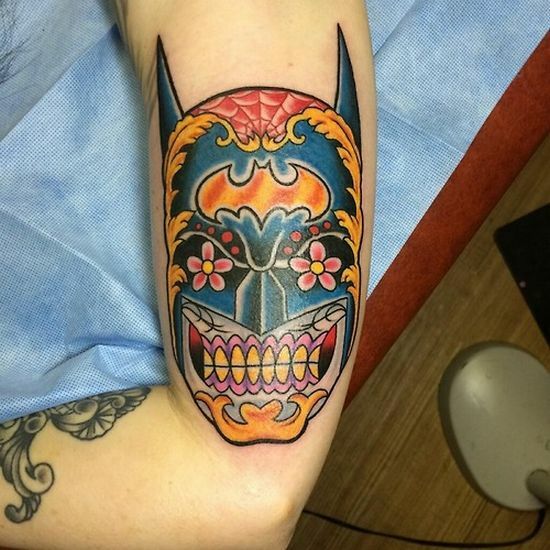 A tattoo of batman as a sugar skull on the forearm. 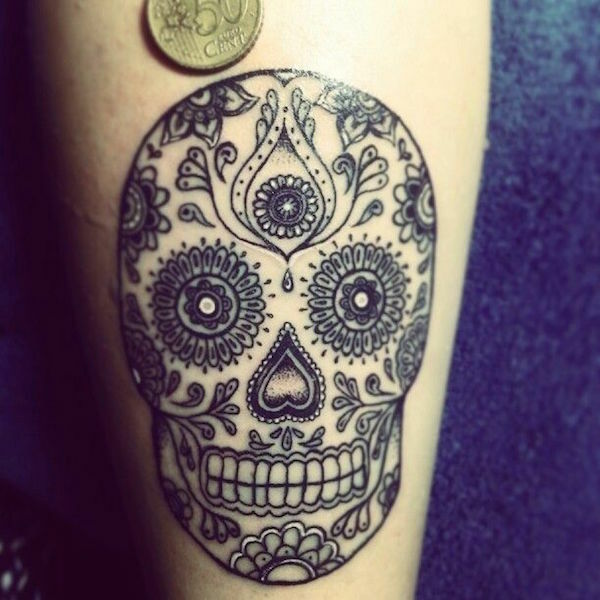 An intricate black ink sugar skull tattoo. 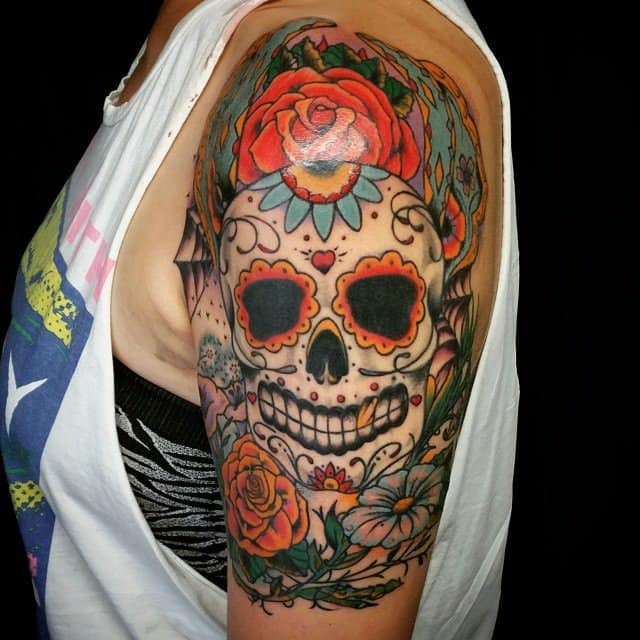 A large upper sleeve tattoo of a sugar skull with roses. 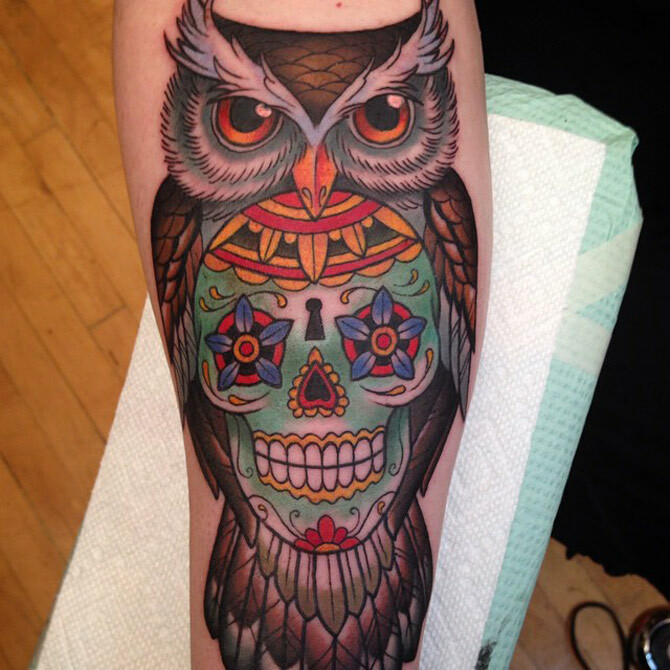 An intricate and colorful sugar skull and owl tattoo on the leg. 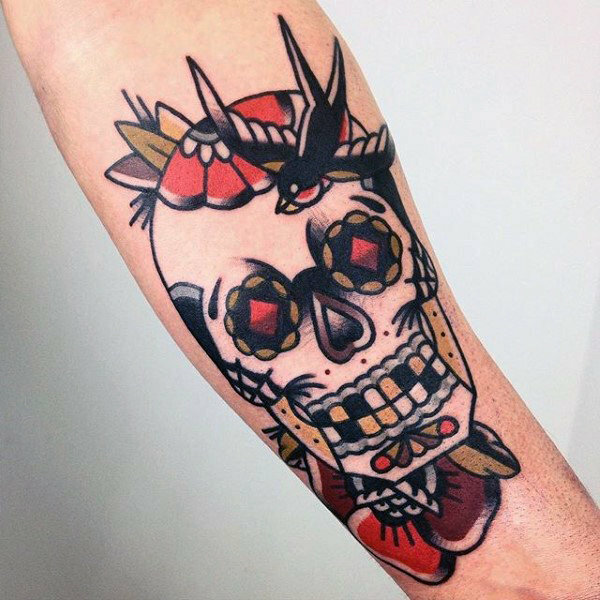 A neotraditional style sugar skull tattoo. 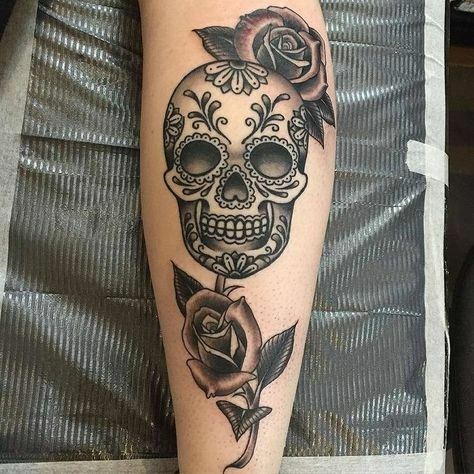 Like what we have said earlier, This is one of the few tattoo designs out there wherein men and women do not differ that much when it comes to choices of how they detail their sugar skull tattoo. Both men and women almost have the same preference to this tattoo design. 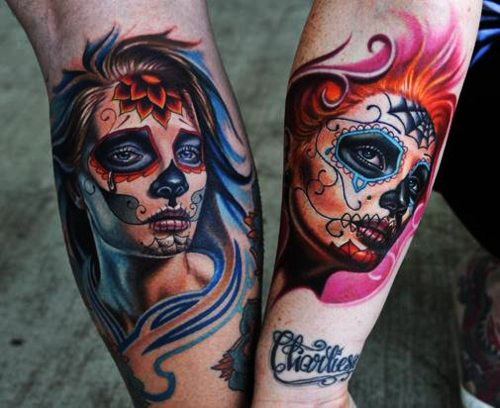 The one thing that we think that might differentiate a woman’s sugar skull tattoo from a man is the use of color. Women usually tend to go for more feminine oriented colors for this tattoo to match it with their fashion, mood, and personality. 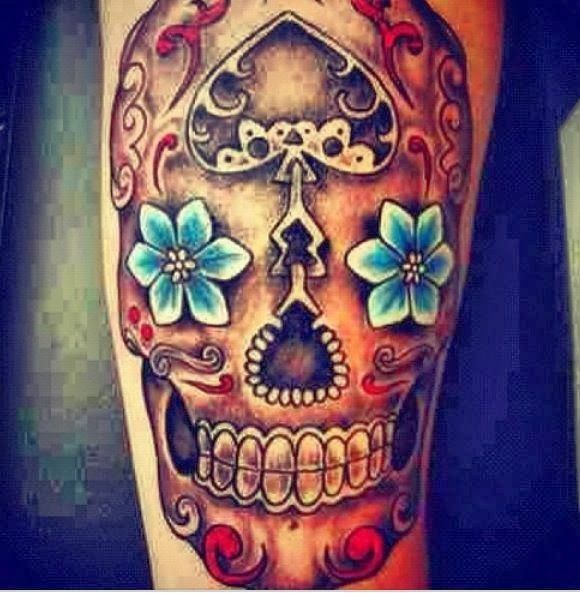 A female sugar skull tattoo with blue flowers inked on the leg. 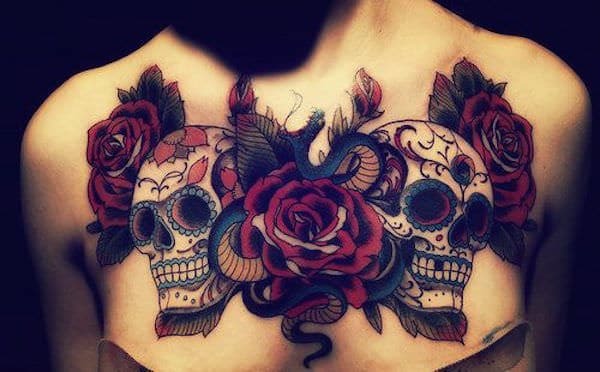 A pair of intricately designed sugar skull tattoo on the chest with roses. 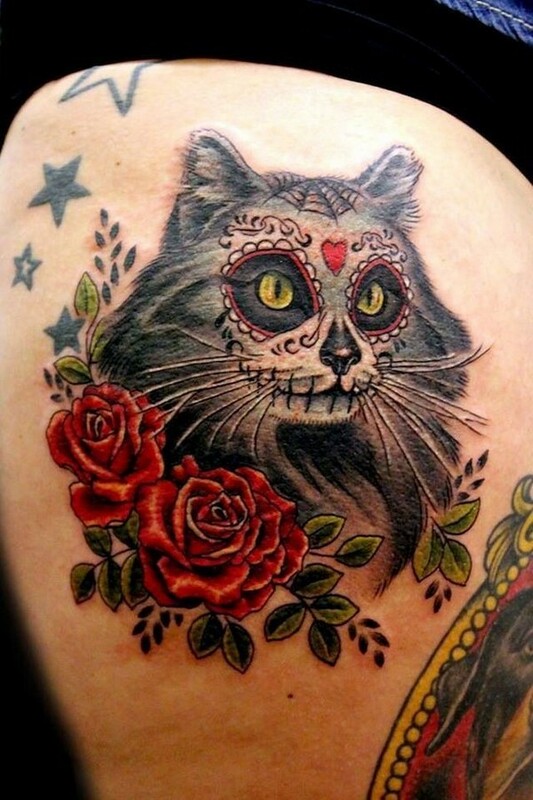 A raccoon sugar skull tattoo with roses on the thigh. 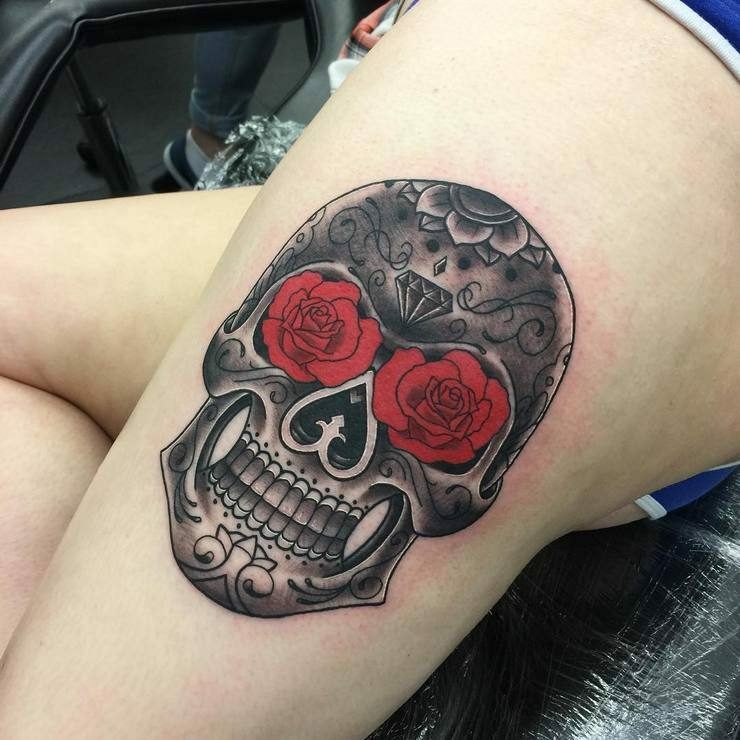 A sugar skull tattoo on the thigh with a big rose. 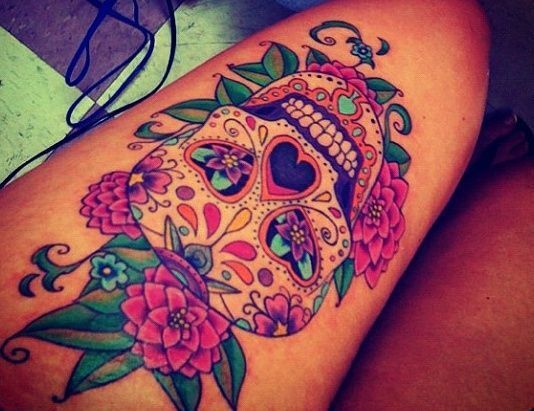 A colorful thigh tattoo of a sugar skull. 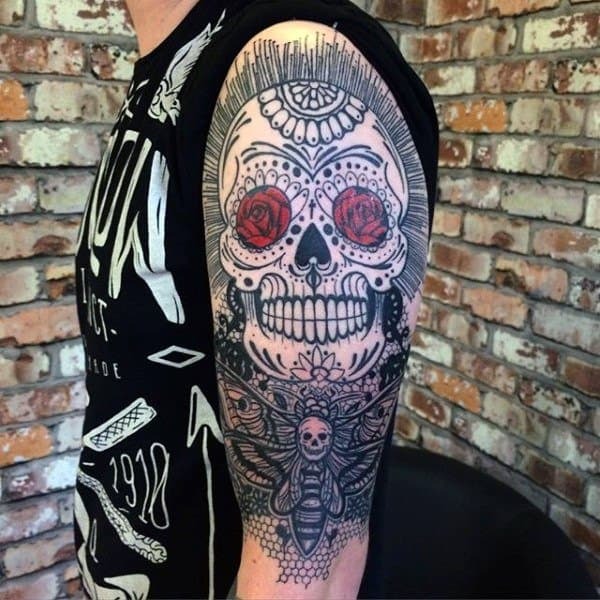 An intricately made black ink sleeve tattoo of a sugar skull. A black ink sugar skull tattoo on the sleeve. 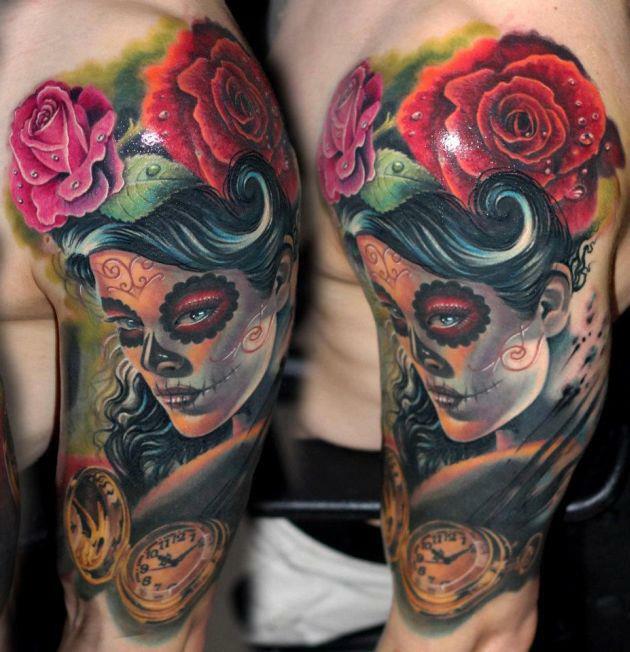 A wonderfully detailed sugar skull tattoo on the upper sleeve. A female sugar skull tattoo on the upper sleeve. 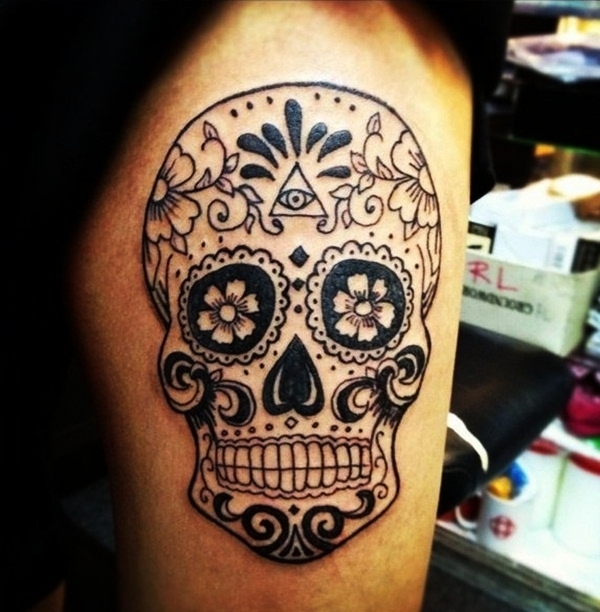 A highly detailed and intricately designed sugar skull tattoo on the thigh.